This distressed chuval was one of my favorite items from the second Ronnie Newman sale at Skinners. My wife noted that it proves I'm a lunatic, and she could well be correct. I'm very interested in other's thoughts about it. That's a fabulous piece; it shines through the wear and damage. I hope some of our incipient Turkomaniacs will notice the plump, well spaced main guls, the excellent drawing of the borders, and the balance of the colors. I'm not at all confident about age attributions, but this one does have an air of great age about it. Regards, and thanks for sharing it. For what it's worth, coming from me, I think it's absolutely gorgeous, and Steve's right. Its beauty shines through the wear and damage. Ronnie had a very good eye. I wonder if the minor guls indicate an Igdyr attribution? Contrary to your Wife's opinion, I think this proves you very sane and that you have a great eye. It is beautiful and I would have bought it and asked the price afterwards. I can find no examples of this minor gul when searching for Igdyr pieces in my books or in Google. The more I was looking at all minor guls in Yomut (and subtribe) rugs, I came to the conclusion that the minor gul on your piece is a "dumbed down" version of the more common - and more detailed - minor guls. If that is correct, I would guess that your piece is younger than I thought, but this is not in keeping with the otherwise old age that is implied in your piece. There is a compelling analog in Jurg Rageth's book Turkmen Carpets: A New Perspective, Vol. 1. See plate 104, page 222 with an example of a Yomut rug attributed to the Gorgan/Atrek Plain or Astarabad. It seems that late 18th - early 19th century is reasonable based on design similarities. There is also a chuval example, less similar but the same date range; plate 82 on page 178. Chuck's analogy references make a strong argument. It is also clear from the other period pieces that there is a regal quality in the 18th century pieces that is mostly absent in later work. Here is a detail of one of the pages Chuck referenced. Clearly, this non=Chemeche is an early minor gul and directly relates to the minor gul of the chuval in this discussion. I believe this referenced gul is earlier since it has curvilinear elements at the tips of the guls, which would place it well into the 18th century. It would be nice to see other examples in main carpets and other weavings. The small rectangles in the field of the major guls relate to the Tekke major gul and would indicate a very early date. Not being registered isn't a problem, but I'd be grateful if you overwrite the word "unregistered" in the User Name field with your name when you post. 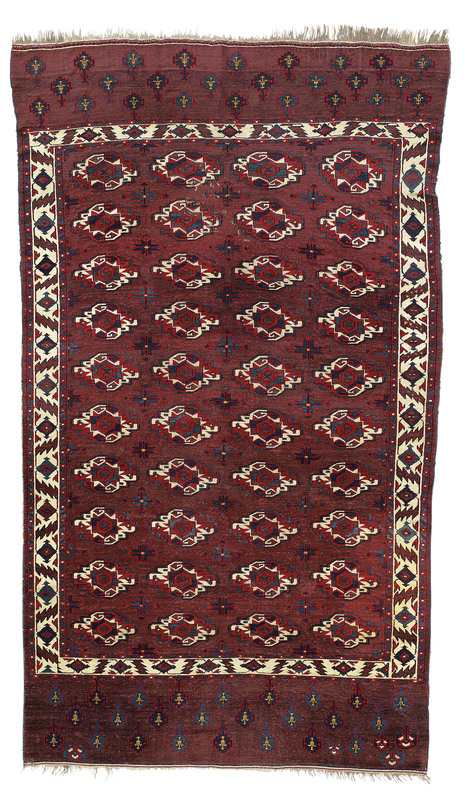 The Christie's main carpet is a grand example of the Zenith of Turkmen weaving. Last edited by Michael Gordon Rosenthal; January 25th, 2019 at 02:36 AM.